Gunpowder is one of my personal favorites, for green tea. However I have only ever purchased it from one or two sources, so I was excited to be able to try it from a company whose gunpowder I had not tried before. 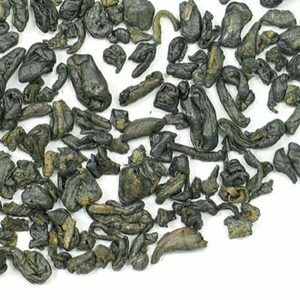 Gunpowder is a simple green tea, but sometimes the differences between the same tea from different companies can be quite noticeable. These same aromas swell in the flavor of this tea, and the grassy sweetness permeates all taste buds. The smokiness of this tea is stronger than other gunpowder greens that I have tried, and it is a good addition, in my opinion. Adagio's Gunpowder is available from the Adagio website, here. Photo credit to Adagio Teas.